The dog that Mary is petting is very fluffy. The dog Mary is petting is very fluffy. …but only the first of the following two sentences is acceptable? In this article, I’ll be talking to you about sentences in which you can (and can’t) omit relative clauses, such as who, that, or which. John is my friend. He is wearing jeans. John is my friend who is wearing jeans. I drive a car that was made in Germany. English is a language which has a very complicated grammar. The teacher who taught me English knows thousands of words. Make sense? Great – now that you’ve got an excellent idea of how relative clauses work, you’re well on your way to figuring out when you can omit relative pronouns. 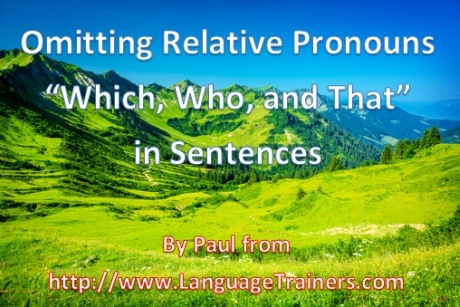 Relative pronouns can be either subjects or objects. However, subject and object relative pronouns look exactly the same, so you need to be a grammar detective to figure out which ones are subjects and which ones are objects. Luckily, I’ve got some tips that makes it easy to find out which is which. The woman who rode the subway was very pretty. As you can see, the verb “rode” comes right after the relative pronoun “who” – and therefore, we know that the relative pronoun is a subject. The woman whom John saw on the subway was very pretty. Here, the relative pronoun “whom” is followed by the proper noun “John”, and therefore we know that it is an object. So we’ve mastered the relative clause and the distinction between subject and object pronouns. What, you ask, does this have to do with omitting “that”, “which,” and “who”? Do you notice anything about these sentences? Indeed – in this sentence, the relative pronoun “that” is an object. Note that here, you can omit the relative pronoun! The dog that has brown fur is very fluffy. Aha! Here, the relative pronoun “that” is a subject, because there is a verb right next to it. And not that here, you cannot omit the relative pronoun. Right now, you might be thinking, “This makes sense . . . but how can I possibly do it quickly enough?” Indeed, it seems like a lot of work to identify a relative clause, see if the pronoun is a subject or an object, and then decide if you can omit it. Luckily, there are a couple ways to do this quickly and accurately. First, just focus on the verb, not the pronoun! If there’s a verb immediately after the relative pronoun, you know it’s a subject, and you can’t omit the relative pronoun. If there’s no verb, you’re good to go – you can create a contact clause! The water I drank was very cold. Second, practice makes perfect. Constantly rehearse and perfect your English, and you’ll internalize all of its complicated rules in no time. Take advantage of the free resources on the Internet so you can practice every day, even if it’s just for a little bit. Now you know all there is to know about contact clauses, and when you can or can’t omit relative pronouns like “who”, “which”, or “that”. Practice what you’ve learned by listening to native speakers — you’ll be astonished by how frequently you hear contact clauses in casual conversation! 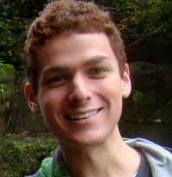 Paul writes for Language Trainers, which provides individually-tailored language training on a one-on-one or small group basis worldwide. The English Accent Game is a free educational tool that Language Trainers provides; you can find that and other free resources on their website, or email Paul at paul@languagetrainers.com for more information. There is a verb to be (‘was’ in this case) after the relative pronoun (‘who’). When there is a verb, then the relative pronoun must be there. It cannot be omitted. I could say instead: the anxious woman in the club seemed to be very rich. “Everything he wrote was stupid.” Both are ok. It would be inaccurate, however, to write (like my first example, omitting THAT HE), “Everything wrote was stupid.” However, if we change to passive voice and make the verb past participle, it seems ok: “Everything written was stupid.” What’s the ruling with omitting sub/verb in a passive-voice relative clause? “Generally, people would start meal with soup, followed by a fish dish, and then a meat dish.” Could you explain me what is the original form of “followed by a fish dish”? If that sentence is in regard to relative sentence, what is the relative pronoun of the sentence? Well explained. Have you noticed that newscasters and other public speakers are dropping pronouns? It seems to be part of a style sheet that calls for dropping several parts of speech I was always taught were important for clarity- prepositions, conjunctions, articles and even subject pronouns of the main clause. The rule? One syllable words aren’t needed. It’s not about efficiency- for every syllable they cut, they add two or three with a related rule- always use the biggest word possible (e.g., additional, not more or extra; complimentary, not free). Less isn’t more, it seems. Additional is more! Neither of those sound 100% good to me; I’d shorted in the following way: “The anxious woman in the club seemed to be very rich”! It was a great explanation.thank you so much. I have a question,haw we can change and shorten this sentence?? The woman who was anxious in the club,seemed to be very rich. 1) the woman being anxious …. 2) the woman anxious …. Which one is correct? ?1 or 2? Yes, “who” does indeed act as a subject in this instance, but the weird thing about this sentence is that you can omit “who are” because there’s another clause proceeding the second one and “the same ago as ours” becomes an adjective clause describing the noun “children”. As a matter of fact, you can omit “that” in the first clause: “It’s great they have children the same age as ours”. It’s great that they have children who are the same age as ours. It’s great that they have children the same age as ours. “WHO ARE” was omitted, but doesn’t it act as a subject? Hi, In the sentence “Next time ____ you write to me, you must tell me all about your new job. Why can you omit the word when as well? I thought you’re only allowed to omit who, which or that. I’m sure you’ll find it very relevant in relation to the question you asked! I get what you’re saying — it seems like “made” could be just an adjective, in the same sense as “well-made” is an adjective in the sentence, “The car was well-made.” However, “The car was made in Germany” is pretty clearly passive voice — because we can say “The car was made in Germany by Volkswagen”. We can’t say “The car was well-made by Volkswagen” (or at least it sounds very unnatural). The mismatch between syntax and semantics is pretty well-documented in the literature. The reason is that English *always* needs a syntactic SUBJECT. In “The car was made in Germany,” there’s no semantic subject — the car is the semantic object, as you said. But we need a syntactic subject, so we resort to treating “The car” as a *syntactic* subject, even though it’s a *semantic* object. Weird, huh? Something kind of similar happens when we describe the weather. “It is raining” doesn’t have a semantic subject, but we need a syntactic subject, so we add the pronoun “it”, whose *sole* purpose is to give us the semantic subject that English requires. Thanks for the additional explanations! It makes sense somewhat and it’s now much clearer for me but it’s still confusing. I guess it only shows that it’s difficult to come up with simple internally consistent grammar rules because in this case semantics and syntax seem to be in contradiction to each other! Could this contradictory to be solved somewhat by thinking that the sentence “The car was made in Germany” isn’t even in passive voice but in this particular sentence “the car” would be both semantically and syntactically subject and the past participle “made” would function as noun or as adjective which described the state of being of the car? Or is my explanation way too artificial or even wrong to think like that? The passive voice in English is one of the weirdest and most confusing things about the English language. Therefore, for the purposes of omitting (or not omitting) relative pronouns, it still follows all the rules of being a *subject* pronoun. Omitting the pronoun isn’t possible. In this case “to be made”, or so it seems to me, isn’t even subject to the rules explained in this article due to the fact “made” is the Past Participle! This is handy explanation because I don’t remember that omitting relative pronouns was taught to me in the school but one thing is not clear for me: Is it correct to omit relative pronoun in the sentence “I drive a car that was made in Germany.”? The sentence contains passive form “was made” and therefore “that” is object despite the thumb rule that relative pronoun is subject if it is preceding a verb! Following the “object rule” omitting is possible but following “verb rule” omitting isn’t possible!? Or is it right to omit the whole “that was” and to write “I drive a car made in Germany.”?